After the previous hypothesis about Mini Linear Actuators, there have been a few comments regarding another possibility of how they could work. Also, there was a question about how could such a part be assembled. First of all, this is how I think the mLA (the first proposal, shown on the previously mentioned blog post) could be assembled. 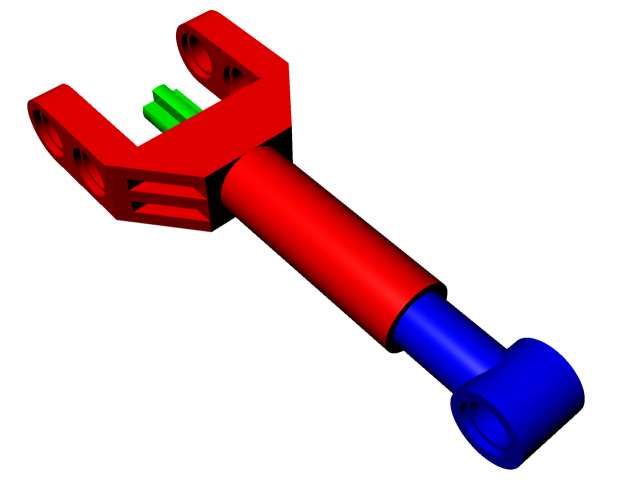 The bracket (red) part could be composed of two sub-parts, which are joined together after the axle/sleeve (green) part is inserted. 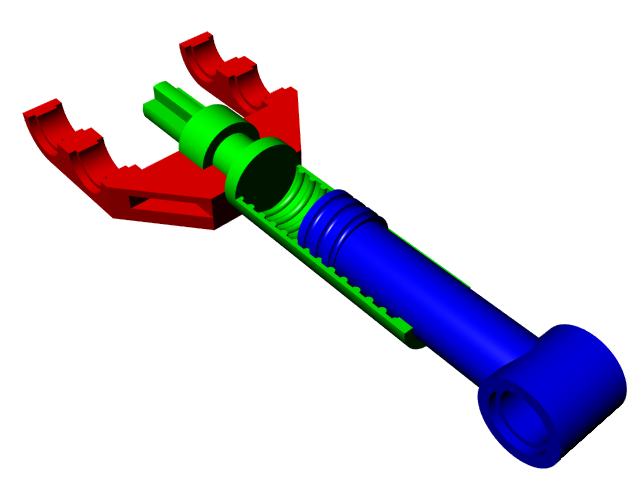 The green part would also need to be composed of two sub-parts, to allow the piston (blue) part to be inserted between them. 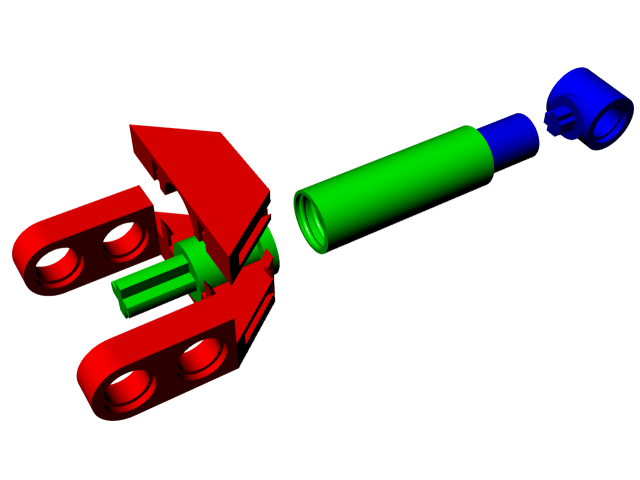 Finally, the piston (blue) part could be composed of the screw and the pin hole; these two would need to be separate sub-parts again to allow insertion inside the green part. I found this a bit difficult to explain, and you most probably found it a bit difficult to understand, either. So, if you look at the cutaway image I posted earlier, you'll notice the narrowing at the tip of the green sleeve. This prevents the blue piston from coming off when extending too much, but also requires all these sub-parts to be constructed and assembled. So, what I thought would be a simple and cheap way to construct mA's turned out to be rather complicated... therefore, let's see the other alternative that was suggested and I modelled. This one is much closer to how "regular" LA's work. 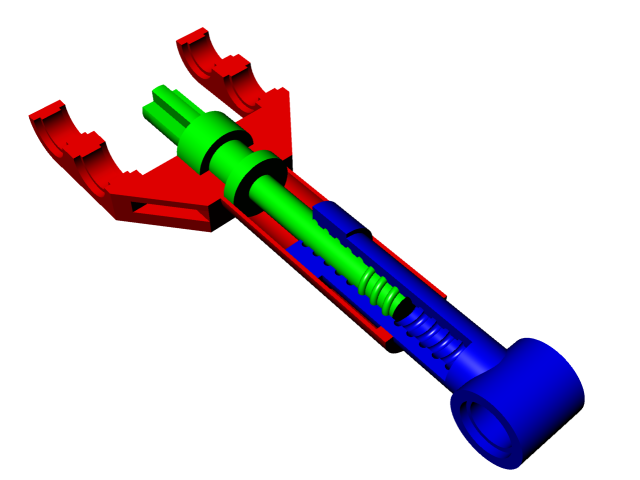 An intermediate (in blue) one, which constitutes the mLA's piston. It has an internal thread, which mates with the innermost layer. An inner (in green) one, which spins and has on one end an axle (or maybe axle hole) and a screw on the other. This screw is responsible for extending and retracting the piston. While this design is probably more fragile than the first proposal and therefore quite possibly unable to handle anything but the lightest loads, it is not only not more complicated (the assembly process would be similar to the one above for the previous suggestion) but also it's a lot more realistic. I'm also in favor of the 2nd interpretation. However it looks to raise more or less the same kind of assembling challenges. I also the new mLA to be targeting other functions than those facing very small loads. your 3d models and cutaway are really neat - what where they made in? how many hours does it take you to draw these? amazing! It is pretty simple if you have some knowledge on solids modeling. Of course you need sometime to overcome the tools learning curve, but once done you can do it in one or a couple of hours. These examples were done by Alexandre with Rhinoceros, while I've been drawing also some new parts concepts, with the same tool. Should present them here sometime ahead. I'm also thinking into this new 3-part solution as being how the mLA's will be made. But we'll see soon enough I think. There usually are some early leaks of boxes to reviewers etc. Excuse me, I would ask the names of the sets will be available for the second half of 2011? I really hope the mLA has some metal in it (the piston is the best candidate), but I doubt it: four of them on a 50€ set doesn't give much margin for luxuries. A wholly plastic part would weaken it much, to the point that applications like a miniature version of my PF train switch seem a bit unlikely (unless perhaps LEGO replaces the current point lever with a more automation-friendly version with pin or axle hole)... we'll see. @bazmarc: thanks! The only measure I have of the time I take to make these models is "too much"... I started doing them after dinner and finished around 4 AM. And I already had the first mLA proposal to work from! Ya, too soon to have any kind of info about the 2H11 sets in public domain.